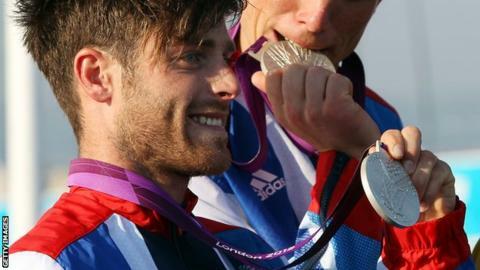 Scottish sailor Luke Patience is among eight British sailors selected for the Rio Olympic Team GB squad. Patience, 29, won silver three years ago with Stuart Bithell, and this time teams up with two-time world champion Elliot Willis in the men's 470. "It's such an exciting phone call to get and it just gets the wee butterflies going," said Patience. "I'm always proud to don the Team GB shirt and here we go again. Round two, let's fight." Patience and Willis won the European Championships just six months after getting together, and in January won gold at the ISAF Sailing World Cup Miami. Patience said: "You dream about a single thing for so many years of your life, certainly all of my adult life in my case, so to get the call saying you're selected for the Olympics is just so good, such an honour. "I'm just so pleased to be in a team with Elliot and be able to experience his first excitement to it all. He is a very grounded guy and he is very unaffected by the occasion, but let's be honest it's the Olympic Games, and it is going to be a good one. "I'm so pleased to be in a boat with him, we get on really well. We raced each other hard, to the bone, in our younger years and here we are in the team together. "Stuart and I had a fantastic experience last time round and I'm sure me and Elliot and I are on the same path to have a fantastic experience to go and race hard. He has got to be one of the most talented and successful sailors that has yet to go to the Olympic Games so I'm so pleased that he has that opportunity." Asked about how he expects Rio to compare to London, Patience told BBC Scotland: "It'll be a new challenge, totally different. "We're overseas, it's trickier out there - the culture, the climate - and trying to make somewhere over the other side of the world feel like home." "I do this sport to win, I don't do it for any other reason. "I would be lying if I said I wasn't going there next year to try and bring home a gold medal. That is the goal, it's what drives us every day, it's what gets me out of bed in the morning and it's what driven me for all these years." Giles Scott, Saskia Clark, Hannah Mills, Bryony Shaw, Nick Thompson and Alison Young are the others who were named on Wednesday morning.